You’ll return home from your luxury island holiday in Phuket with stories about how you fell in love with the Thai experience. 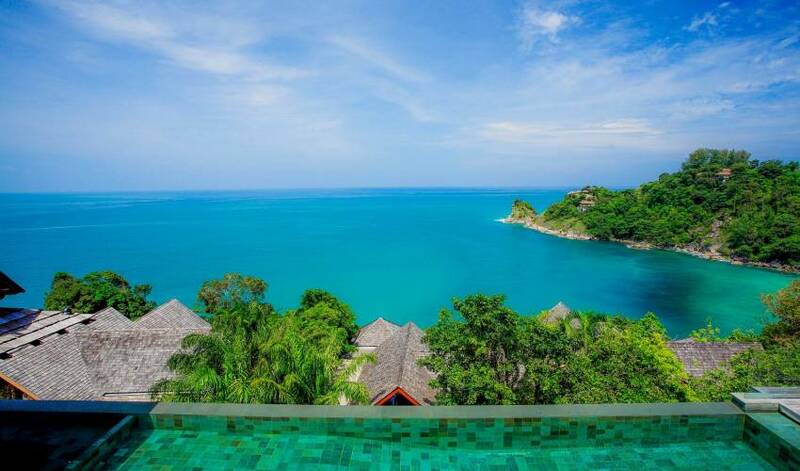 Fabulous food, friendly people, amazing tropical locations and vistas, not to mention your 5-star luxurious Baan Santisuk in Kamala, will all help to make your vacation a memorable one. 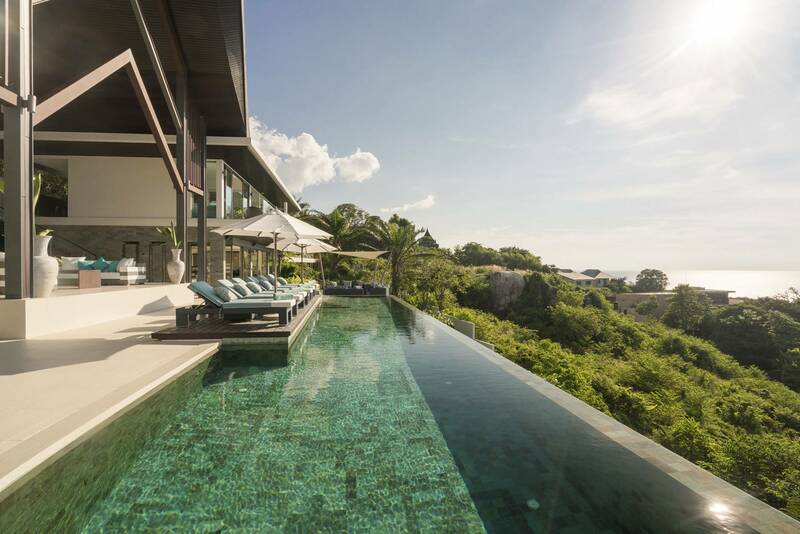 An outstanding Phuket property, this luxury residence is a favourite among discerning tourists who yearn for elegance with all the trimmings. 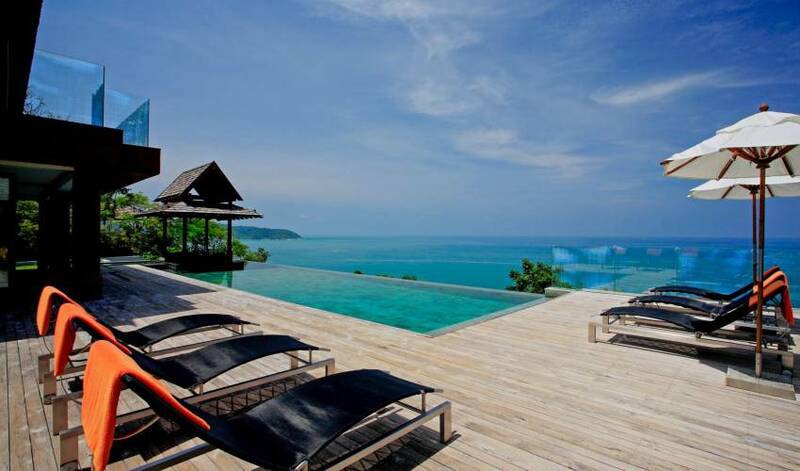 Villa Baan Santisuk is surrounded by two white sandy beaches and has panoramic views over the Andaman Sea. The property has been designed to take advantage of its prestigious location, with open-plan living and bedrooms that bring the outdoors in. With the generous use of expansive glass, bifold doors and high ceilings, you’ll feel at one with your beautiful surroundings. Space, space and more space help alleviate all your stresses to provide a thoroughly relaxing and enjoyable break from the daily grind or the ideal destination for a special event. 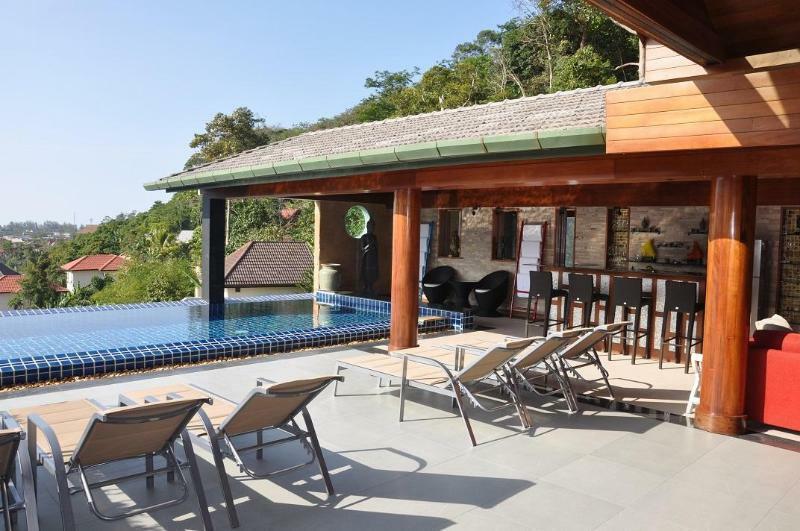 The Phuket Exclusive Villa is managed by Villa Getaways and accommodates up to 10 people with five bedrooms, each with ensuite bathrooms, three with private Balinese-style outdoor shower gardens and one that has an outdoor Jacuzzi. For the ultimate in private entertainment, each bedroom is equipped with its own mini-bar, safe, phone and high-speed broadband internet connection using fiber optic. 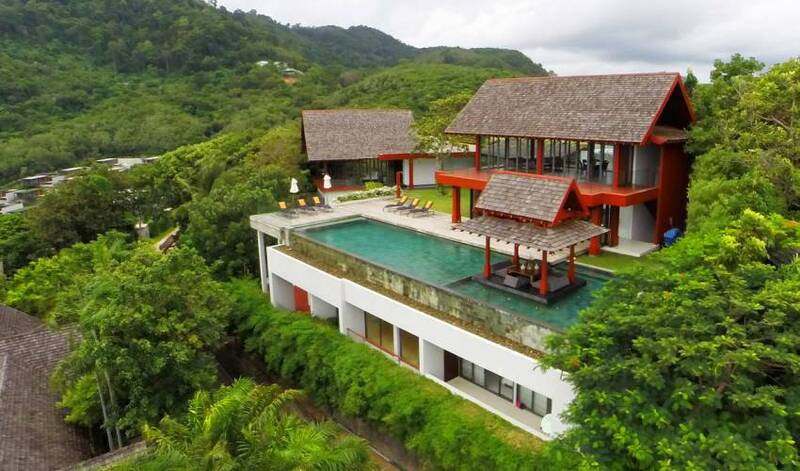 A premier Phuket property, this luxury 5-star villa in Kamala offers an exceptional holiday opportunity for anyone planning a function, such as a wedding, milestone birthday or anniversary. The villa is open for event vacations, however, guest capacity must be confirmed with the owner beforehand, and may incur extra costs. High-speed broadband internet connection using fiber optic throughout the villa area. 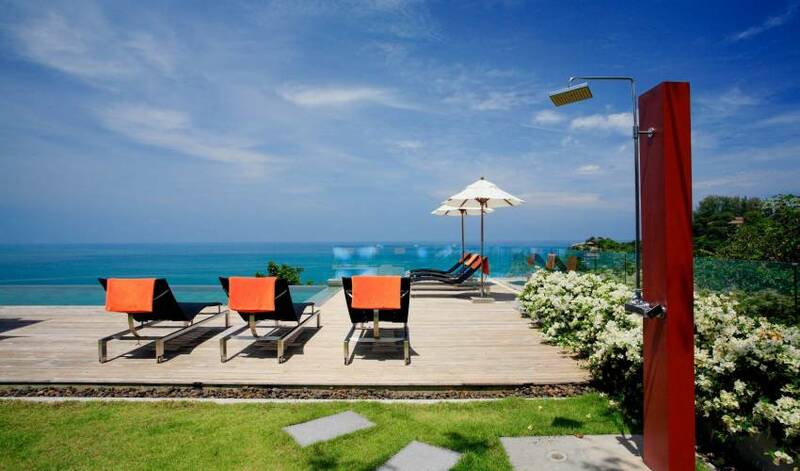 Fantastic Villa between Kamala and Patong on the hill with excellent outdoor space, pool area and living room. Kids loved it as well. Breathtaking sunsets from the villa. Well maintained villa. Kris at Villa Getaways is patient and attentive. Would definitely book again through him. Owners rep is also a fantastic lady. I felt like i owned the island from this hilltop villa! This was the second time I booked with villagetaways.com and both experiences have provided the same level of professional service, villas of superb quality and wonderful memories. Kris Clements, your hand-holding prior to my arrival at the villa make it easy for me to want to deal with you again. Thanks again for yr patience in answering all my questions. On arrival, the villa manager as well as on the ground and round the clock staff pampered us without intruding. We were fed well and the staff observed the stringent diets of the few who could not enjoy the rich local delecacies being prepared for the rest of us. We were a group of eight, ages as young as 7 and as old as 66. We all left with the same wonderful experience. We were all sad to leave. If you do book this villa, when you're in the car from the airport and you feel the urge to point at a villa on a hill to say "Wow, look at that house! ", don't be surprised, as I was, when the driver tells you that's where you're headed! The villa is amazing. fantastic views, well maintained, great location. We hired a mini-van from the villa - a driver named Mun who was very courteous and extremely safe. The cook Mundra serves better food than most of the upmarket restaurants on the island. I recommend you order the food with her before you arrive - she wont disappoint. Wan, Meow and Toi are great support staff who were more than happy to chip in and help entertain our 1 year old daughter. as the villa is in a tropical setting, make sure you bring some insect repellent with you. we didn't have much of an issue with this except when it rained. the only downside to the villa is allocating rooms to the guests as they are on different levels and have different layouts. some have very opulent bathrooms while others have fantastic views. its a tough decision. We stayed at the Villa in early November for three days and hosted our wedding reception on the grounds. The villa itself was a delight to stay in, with five-star luxury at our fingertips. The food and amenities were ideal for a holiday retreat, whilst the views were simply amazing. The staff did everything to assist us and were friendly and polite. We had a perfect wedding in Phuket, and the Villa was a great choice. We stayed here for a week while we were in Phuket for our wedding. While the villa was ultimately too small to host our wedding we had an amazing week living in the lap of luxury, with the most spectacular views! While it is clearly a stunning design it is also very practical with all the modern conveniences and well laid out. every room in the villa is unique and each has its own amazing features, views and spectacular bathrooms. The beds were incredibly comfortable and you would not want to leave them but for the amazing views from outside! The staff were fantastic and made us feel so at home and comfortable without being too obtrusive. The cook was wonderful and would cater fabulous thai food that was so fresh and tasty and at a fraction of the cost of eating out. They would organise for masseurs to come up to the villa for us and they even knew it was our wedding night and decorated our bedroom. I would recommend hiring a car - taxi drivers struggle to find it and charge a lot as its quite isolated but its so close to Patong and Kamala that its possible to survive without a car. Overall this was an amazing place to hang out for a week, relax, party and generally feel like we were on the set of entourage! There was so much space and the views were breathtaking! Definitely heading back here for our anniversary! Kris, it has taken me a month to get around to writing to you to say we had the most fabulous time at villa 4186! I'm so glad you suggested that one to me, it was just perfect for what we wanted. We totally relaxed and to have Mantra and her team looking after us we were just in paradise. They made such beautiful food and also made a real effort on the night of my 40th to make it so special. We all want to go back every year as it was just so perfect, we hardly left the place the whole time. Thankyou also for the lovely flowers from Villa getaways they were gorgeous. When I left I said, "goodbye room, I love you..." I had the master bedroom. The auto blinds didn't work well - kept jamming, but the maids got the ladders out and rolled them up and down whenever I asked. the holiday was a treat so I don't know how much it cost. but it was a lovely escape. the only thing missing was perhaps a storm coming in over the sea, but I won't complain about the big blue skies, gorgeous sunsets or starry nights. We had a fabulous time in Phuket and especially enjoyed our stay at the villa and the picturesque view. The villa stay was truly memorable. The cook was amazing too. Thank you again for arranging this. We really enjoyed the property and would certainly recommend you guys to our friends. We would like to share some with you and have been advertising the wonderful villa to our friends and family. I'm just returning from one of the most amazing vacations I've ever had. Villa 18 and it's staff were far beyond what the pictures could ever portray. We are already looking forward to planning a return trip for Thanksgiving of 2016. Thank you for all of your help with the booking and recommendation, we loved everything about the villa. We are back to reality after having such a fabulous holiday. The villa was spectacular, even better than the photos. The staff were wonderful and that Montra, what a great thai cook she is. Everyone really enjoyed the holiday and want to go back next year. Villa 4186 was such an amazing experience. The house is built beautifully so that you feel like you're on your own island. I love the open floor plans of the pool level creating a fun atmosphere for our entire group to share. 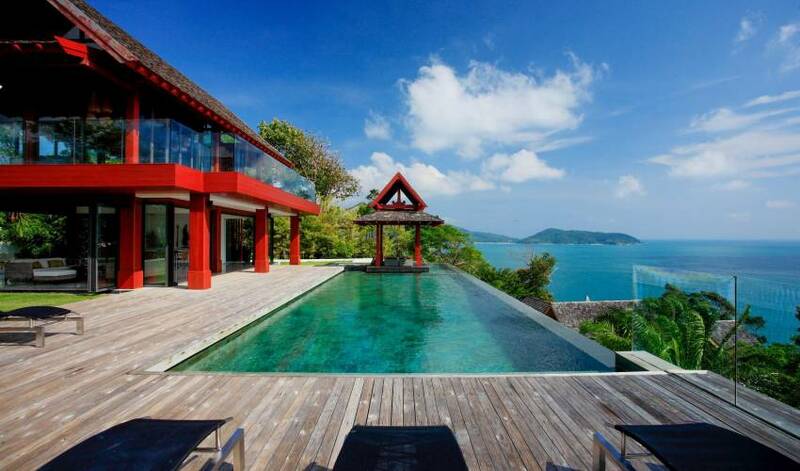 The villa was great, it is the best villa I have stayed in Phuket. Since i have tried 5 villas before. The service was excellent. I would like to thank the villa team on there nice hospitality. We had a wonderful stay and would like to again extend our thanks to the staff at the villa who were fantastic! We would definitely get in touch with you again for future holidays in Phuket. Thanks for all your help in organizing the stay, the villa is amazing and the staff were great. Villa was beautiful and staff were great - and such gorgeous sunsets. We were very lucky with weather. I have sent the link to a couple of friends to recommend it. ironically our friends that joined half way through know the owner in HK! When kids have some time we will post something - it has just been manic since we have been back. We had a wonderful holiday in Phuket. In terms of feedback everything was great. 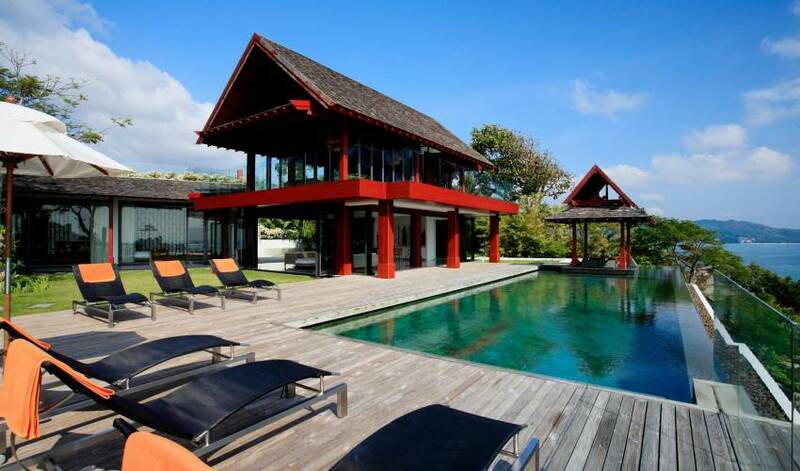 Villa: it’s very beautiful, comfortable, ideal for a group of friends like us. Service and support: the chef is very good, we mainly had Thai food and really liked it.